Located in South Mission Beach, this stunning two-bedroom condo resides in one of the few buildings in the area with a fourth floor (elevator access). 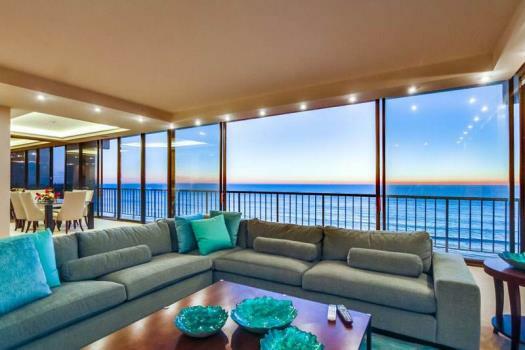 Thanks to this feature, the condo has amazing view of Belmont Park, the ocean and bay. 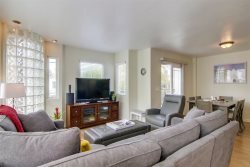 Perfect for a small family, or couples retreat to the beach, the condo provides a modern, but intimate experience. The entryway leads into an open floor plan, accentuated by vibrant beach décor, beautiful flooring, and a living room that combines with the kitchen, offering plenty of space for lounging and dining. Additionally, the attached patio with small bistro set is perfect for watching sunsets over the oceanfront, relaxing with the fresh ocean air, plus amazing views of the surrounding area. Left down the hallway is a spacious master bedroom, along with a great view of the bay from the south-facing window. The room is home to a queen-sized bed, chest of drawers, two night stands, a ceiling fan, and a large closet with sliding mirrored doors. The master bath has been upgraded and has beautiful wood cabinets, new granite counter tops, and a magnificent new shower, plus has grab bars in the shower and bathroom itself. Next, in the middle of the hallway, is the second bathroom. Quite modern with a beach twist, it has also been upgraded much like the master, plus has grab bars in the tub. Finally, the second bedroom is home to a twin over full bunk bed, along with a trundle bed underneath. It too has a wooden chest of drawers, sliding mirrored closet doors, and a large window with built in shutters.